We’d love your help. Let us know what’s wrong with this preview of Murder on New Year's Eve by P. Creeden. It's New Year’s Eve and 20-year-old Emma Wright has a date with her crush—well, not a real date, but she can dream! Colby Davidson, the K9 search and res Ridgeway Rescue Mysteries can be read in 1-2 hours. Perfect for when you're waiting for an appointment or just want a fast read. Don't miss out on this quick, clean, cozy mystery that will keep you guessing until the end! To ask other readers questions about Murder on New Year's Eve, please sign up. Cute short story set at New Years. Murder on New Year’s Eve is a short fast murder mystery, cloaked with hints of romance, with good characters, and with a dog. Once you introduce a dog, you’ll always have this reader hooked. And the romance is nicely low-key. The location—a new year’s carnival with lights, countdowns and all the sounds and hurry—becomes quickly real. The mystery is intriguing enough to hold the reader’s attention through a short story, and pleasing particularly as it’s a woman’s sense of detail that draws in the Murder on New Year’s Eve is a short fast murder mystery, cloaked with hints of romance, with good characters, and with a dog. Once you introduce a dog, you’ll always have this reader hooked. And the romance is nicely low-key. The location—a new year’s carnival with lights, countdowns and all the sounds and hurry—becomes quickly real. The mystery is intriguing enough to hold the reader’s attention through a short story, and pleasing particularly as it’s a woman’s sense of detail that draws in the clues. Murder on New Year’s Eve is a fun fast read. It’s certainly enough to make me want to read more of the series—and see more of the dog please! Disclosure: I’m not sure how I got it but I read it on New Year’s Eve, waiting for the New Year. As Emma Wright dreamed about her relationship with Colby. She watched him ordering hot chocolate for both of them. She was upset that Colby would miss the first word lighting of the illumination of the words Happy New Year 2018! y review today is on the mystery, Murder on New Years Eve. This book is one of A Ridgeway Rescue Mystery Series. This is a great read although very short. I've never read any of this author's work but I really enjoyed this story. The story is well written and intriguing. I'm sure you are going to love it and I'm also sure I will read more from this author. Emma Wright is the sheriff's daughter. Her single father took her to crime scenes all her life. Tonight she asked her father if she could atte y review today is on the mystery, Murder on New Years Eve. This book is one of A Ridgeway Rescue Mystery Series. This is a great read although very short. I've never read any of this author's work but I really enjoyed this story. The story is well written and intriguing. I'm sure you are going to love it and I'm also sure I will read more from this author. Emma Wright is the sheriff's daughter. Her single father took her to crime scenes all her life. Tonight she asked her father if she could attend the New Years celebration with her secret crush, Deputy Colby as he patrols the park for the festival. It's not a real date but she likes to think it is. A strange man comes up to them and asks Colby to take a picture of him when the light of the sign lit up. Emma finds the man odd. Deputy Colby Davidson and his K-9 partner, Gabby were glad for the company of Emma and her three month old puppy Molly. As he makes his rounds a man asks him to take a picture of himself in front of the sign that lights up a new word every twenty minutes. They didn't realize that this man was using them as an alibi for a murder. Colby is amazed when Emma starts asking questions of the suspect. Her father listened to her every word as he has tried to get her to join the department for years. Murder on New Year's Eve was a fun, short mystery, perfect to start the year with. If you read the blurb above, you know it was murder, of course. Emily's youngish, 20, but her dad, who she has lived with since her parent's divorced when she was about 11, is the local sheriff, so she's been around crime scenes and cops most of her life. When she's helping solve the case, she's intelligent and observant. When she's working with her foster dog, a St. Bernard, she's patient and caring. When she's t Murder on New Year's Eve was a fun, short mystery, perfect to start the year with. If you read the blurb above, you know it was murder, of course. Emily's youngish, 20, but her dad, who she has lived with since her parent's divorced when she was about 11, is the local sheriff, so she's been around crime scenes and cops most of her life. When she's helping solve the case, she's intelligent and observant. When she's working with her foster dog, a St. Bernard, she's patient and caring. When she's thinking about her crush, Colby, she seems like she's 13 and I want to roll my eyes, but maybe that's part of being 20 in a small town, shelter by a sheriff father. This is the first novella in the Ridgeway Rescue Mystery series. It introduces us to Colby, Emma, and Emma's dad as well as two very awesome dogs! After reading the others, I couldn't wait to jump into this one as well! The Good: Emma is a bit...well, flighty...but she's a total sweetheart and far more observant than I will ever be! Colby is strong and responsible and you just know there's a backstory there that you want to dive into! The Bad: I read this out of order so this was the last one tha This is the first novella in the Ridgeway Rescue Mystery series. It introduces us to Colby, Emma, and Emma's dad as well as two very awesome dogs! After reading the others, I couldn't wait to jump into this one as well! The Bad: I read this out of order so this was the last one that I read and I was sad to discover there were only three so far. I can't wait for more! This cozy murder mystery was a fun read! With a steady pace and likeable characters, it was easy to love this book. As a dog person, I adored Molly, the Saint Bernard puppy. Her exuberant personality is juxtaposed to Gabby's, the K9 dog, who was more reserved—at least while on duty. I hope to see more of Molly and Gabby in this series. I look forward to reading the rest of this series as each book is released. This book was OK. The culprit was obvious right from the start. The journey to the reveal was the more interesting part of the story. I think the characters were a bit stilted, and the plot needed better development, but it is a short story and a quick read. I'm not sure that I would read more of these as I felt that the story was pretty basic and I like more convoluted mysteries with a story behind the story. I consider th I s mystery as average. I liked it because I read it on New Year's eve. I liked it because it was short and readable in a day versus long drawn out mysteries. I disliked what part the dog played in this book . I couldn't get the connection. Overall it was an ok and somewhat enjoyable. Emma with Molly’s help, her St Bernard rescue dog, help her father solve the murder mystery on New Year’s Eve in her hometown. I’m looking forward to reading about further adventures with Molly and Emma. Short and sweet!!! And an interesting story too!!! I loved how the story started with Emma and Colby on a sort of date for New Years Eve. Then with the clever way that the murder was added in was quite interesting. I don't write spoilers -- but OMG this was an amazingly cute story!!!! And the addition of the dogs made it that much more interesting!!! If you are looking for a good short read story then this is for you. I read it while waiting for my Doctors appointment (actually I finished reading it while I was waiting which does not say much for my Doctor). This is a short but complete story and I will read others from P. Creeden. I knew where the clues would be and I was right. A quick read that kept you turning the pages as the clues were unmasked & the mystery was solved. Good plot with likeable characters. Check it out for a quick read. I enjoyed this story, and I particularly enjoyed the interactions of the dogs with the humans and with each other, especially Molly. The characters were not as well developed as I would have liked, but I guess there's not enough time to do that well in a short story. I enjoyed this short story by p. Dresden and look forward to reading more in the series. A story full of character but takes only one short sitting to read. A nice quickie. What great team work, Emma & Molly. This is a fun book to read, the 2 "girls" are both special. This is a book mystery lovers of all ages can read. Thank you, Ms. Creeden. Fantastic quick cozy murder mystery, I just loved the characters especially Molly! The pace was great and i really liked how the whole mystery was unraveled. I can't wait to read more in this series and get to know the characters more and find out where things go for Emma and Colby! Love reading holiday inspired short stories. 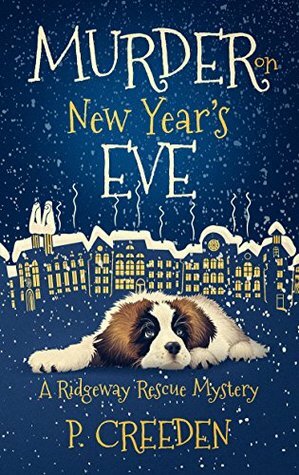 This fun mystery with a unique romantic small town New Year's Eve celebration and a delightful young sleuth, who is the daughter of the sheriff and her rescue St. Bernard puppy made this avid reader chuckle wanting more. I picked this book because I wanted a quick, easy read for my flight. It definitely delivered on that. It's all of 41 pages long and took less than an hour to complete. The writing was decent and the plot was to the point. You just know who did the murder but he seems to have a solid alibi. But Emma and Molly aren't convinced. A great short mystery to fit into your day! I enjoyed the book. The author is new to me. It was a good story but short. If you are short on time but want a murder mystery this will work fine. I gave this book five stars because I enjoyed the story, it was well written and the perfect length for a good break in the middle of the day. I remember being that tongue tied around cute guys... How she could keep her head straight enough to find the differences in the photos? Go girl! This was a great book and a quick read. I highly recommend this book to all cozy mystery lovers. I can't wait to read the other 2 books and hope more are to follow. As promised, the story was short, not too many twists, no gore [which is good!!]. But it could have been a bit more developed. A quick read. Only took an hour. A cute story and good length for when you only have a short time to read. This was a nice short Cozy Mystery but too short because I' m a fast reader. The storyline and the characters were interesting. This was a fun short story. My only issue is that I wished it was longer.